walnuts | Cooking With Mr. C.
1. Combine all dry ingredients in a large mixing bowl and set aside. 2. In another large bowl, mix together milk and mashed sweet potato. Stir until creamy. 3. Grate frozen butter through the large holes of a grater and add to dry ingredients. Mix well. 4. Combine dry ingredients into sweet potato mixture. 5. Pour mixture onto a floured surface and knead until it comes together. 6. Roll into a circle and use a floured rolling pin to roll dough to a thickness of about 3/4 inch. 7. Use a 3-inch cookie cutter to cut the dough into round shapes. Keep rolling dough until finished making round shapes. * You can also use a glass, to cut the dough. 8. Place biscuits on a baking sheet. Brush tops with heavy cream. 10. Let biscuits cool. When cool, slice open. 11. In a bowl, mix all topping ingredients. 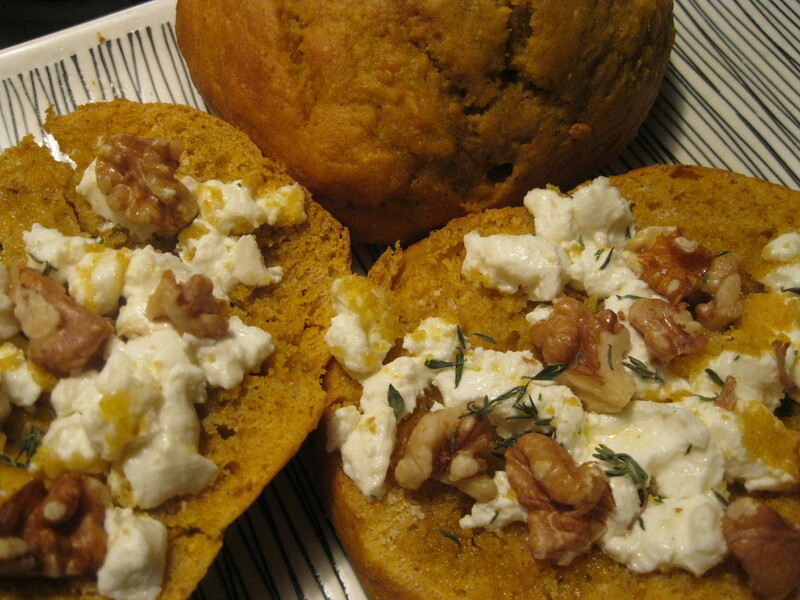 (goat cheese, olive oil, walnuts, sea salt and thyme) Mix well and spread on biscuits. 12. Put biscuits on a cookie sheet. Return biscuits to a 350 degree oven for 5 minutes or until goat cheese is bubbly. Serve hot. 1. Butter a large baking dish. 2. Saute onions, walnuts, and apples in butter until soft in large saucepan. 3. Add remaining ingredients (except bread), and stir over a low heat for about 2 minutes. 4. Place chopped bread in a large buttered baking dish. 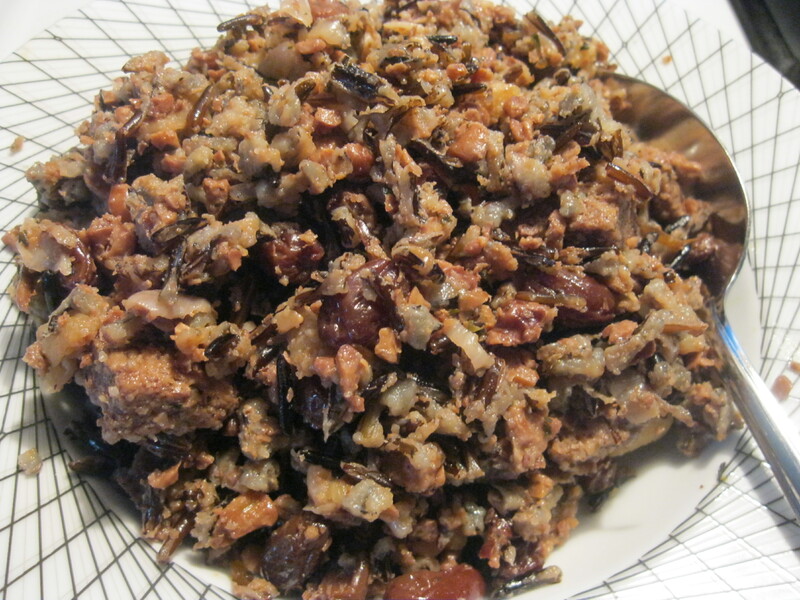 Pour onion, walnut, rice mixture on top. Stir. 5. Bake for about 15 minutes, or until stuffing becomes a little crunchy. 1. Put parchment paper on baking pans. 2. In a bowl, beat eggs, vanilla, brown sugar and butter. Beat until creamy. 3. In another bowl, mix flour, cocoa powder and baking powder. 4. Slowly beat in dry ingredients into egg mixture. 5. Add chocolate and walnuts. Stir it in with a wooden spoon gently. Make sure it is well blended. 7. 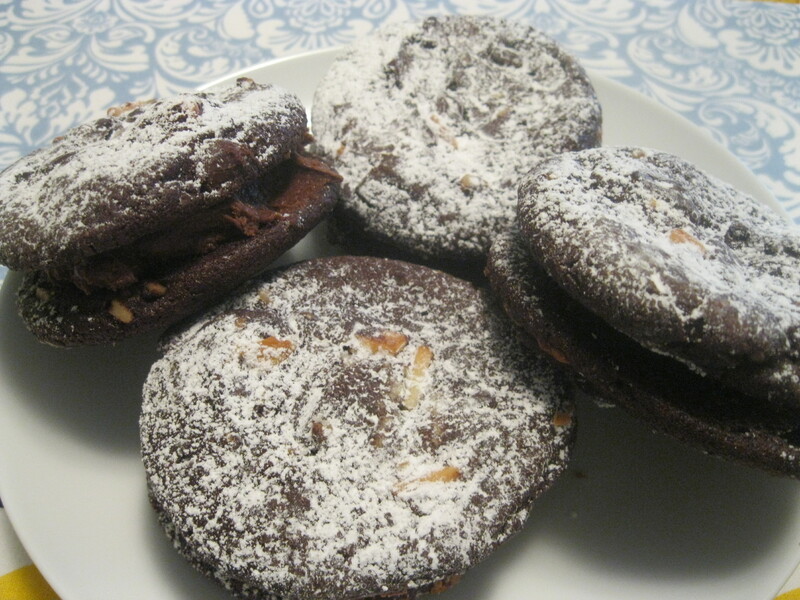 Optional: Sprinkle a pinch of sea salt on top of each cookie. 8. Bake cookies for about 12 minutes. If you made larger cookie bake about 15-16 minutes. Use a toothpick to test if they’re baked. 1. In a large skillet put olive oil. Brown garlic for a minute and then add carrots. Stir well. 2. Add 1 tsp. of sea salt and stir. Stir frequently so carrots don’t burn. If it seems a little dry, add another tbs or two of olive oil. 3. 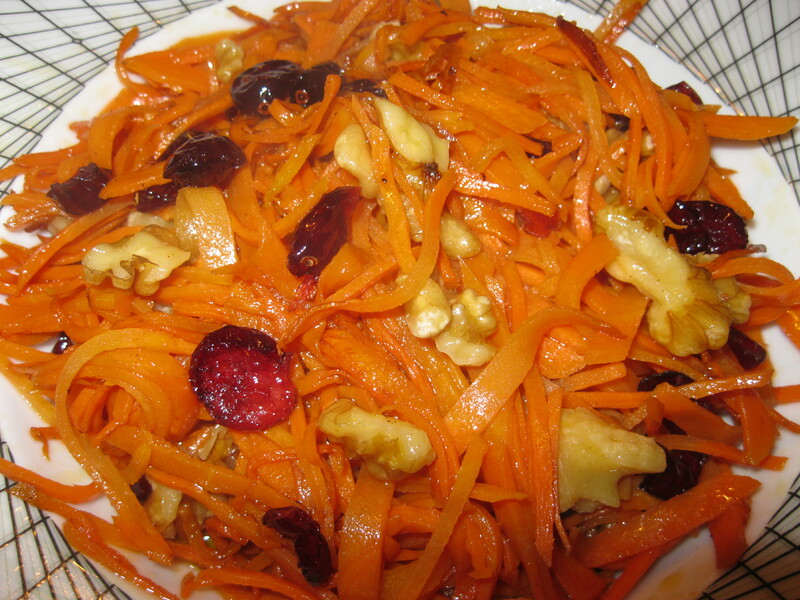 When carrots become tender, add cranberries, walnuts and 1 tsp. of sea salt. Stir. 4. Cook for another 3-4 minutes and serve. 1. Brush olive oil on slices of flounder. Sprinkle a pinch of sea salt. 2. Coat the bottom of a deep baking pan. Place flounder in pan. 3. Cover pan with aluminum foil. Bake for 10 minutes. 4. Remove aluminum foil. 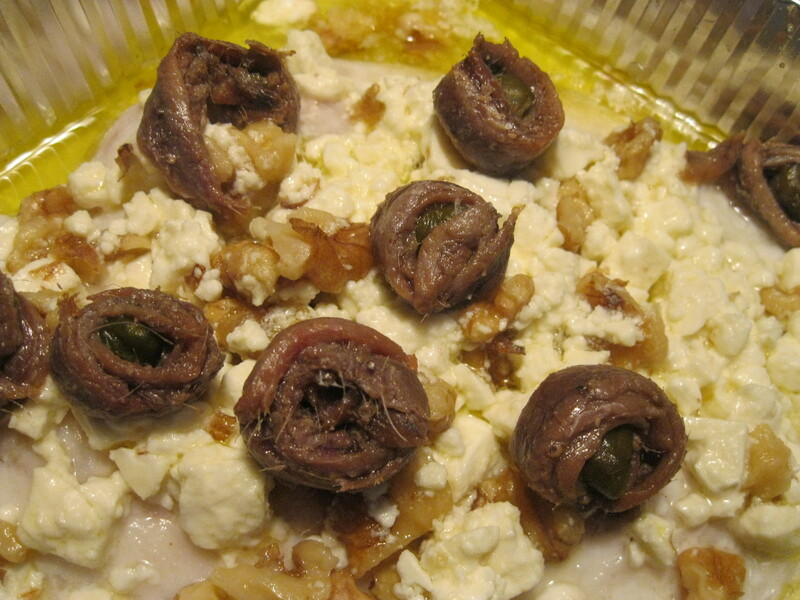 Put feta cheese, walnuts and anchovies on top. Serves 1. Double or triple ingredients depending on how many people are being served. In a pot, put oatmeal and milk. Cook on low heat. Stir and add walnuts. Stir for about a minute. Add Nutella. Stir well. Once oatmeal is cooked (no more than a total of 3 minutes), put in serving bowl. 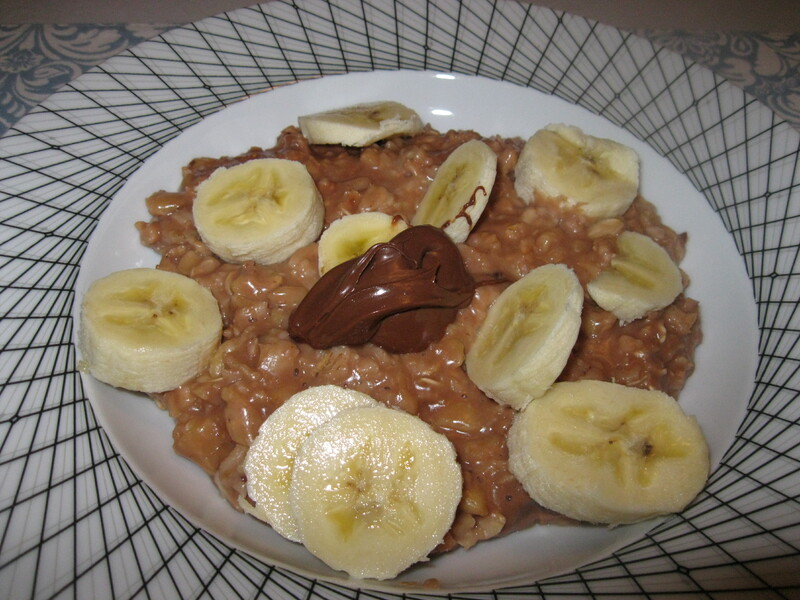 Add sliced bananas on top with a dollop of Nutella. !. Put sliced avocados on a platter. 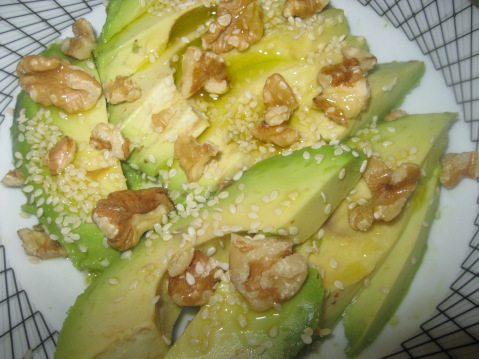 Put walnuts and sesame seeds on top. 2. Drizzle a little olive oil on top. 3. Sprinkle with sea salt.